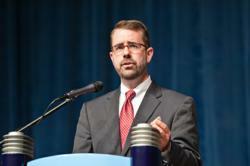 Knox Thames is director of policy and research for the U.S. Commission on International Religious Freedom. He held a piece of an Adventist Church that was demolished by the government of Turkmenistan. When Knox Thames addressed some 900 government officials, religious leaders, scholars and lawyers at the 7th World Congress for Religious Freedom, he held a piece of rubble from a Seventh-day Adventist church building in Ashgabat, Turkmenistan, demolished several years ago by government authorities. In his April 25 presentation, Knox acknowledged that religious freedom is in crisis in many part of the world—the results of which he has seen first-hand through his visits to different countries over the past decade representing the US Department of State and liaising with the United Nations and the Organization for Co-operation and Security in Europe. Knox illustrated the power of advocacy by presenting a case study of the central Asian country of Turkmenistan, which has lifted some religious restrictions during the past decade. With persistent advocacy by individuals and organizations, Knox said that a number of governments, including the United States, were moved to exert diplomatic pressure on Turkmenistan to ease restrictions. It’s this type of determined effort that Knox credits with the eventual easing of registration requirements for minority faith groups in Turkmenistan. “I have seen that the efforts of individuals, faith groups and non-governmental organizations can save lives, change laws, and expand religious freedom,” said Knox. He warned that ongoing advocacy is difficult and results are never assured. He advised advocates to act with discernment and persistence, and to reject the temptation to exaggerate their cause or to speak without knowing all the facts. USCIRF is an independent, bipartisan US federal government commission that monitors and reports on the status of religious liberty around the world. Its Commissioners are appointed by the President and the leadership of both political parties in the Senate and the House of Representatives. The 7th World Congress for Religious Freedom is a three-day event taking place in Punta Cana, Dominican Republic, which has brought together some 900 attendees representing more than 60 countries. The Congress is organized and sponsored by the International Religious Liberty Association—a non-sectarian organization, chartered in 1893, dedicated to defending and promoting freedom of religion for people of all faiths. Daily news, video and photos are available at http://www.irla.org.